The first component of Morning Meeting (the greeting) is really important because it lets kids feel welcome in their class. These 4 Morning Meeting greetings are supposed to be useful for any teacher of any subject area. Whether you teach a special area class, like art or music, or you teach a specific content area or grade, my hope is that these activities can be used and adapted to your liking depending on what you want to do with your class. This one can be as easy or hard as you want it to be. You can use pre-made cards (like playing cards or some sort of flash cards you might buy at the store) or you can make your own. 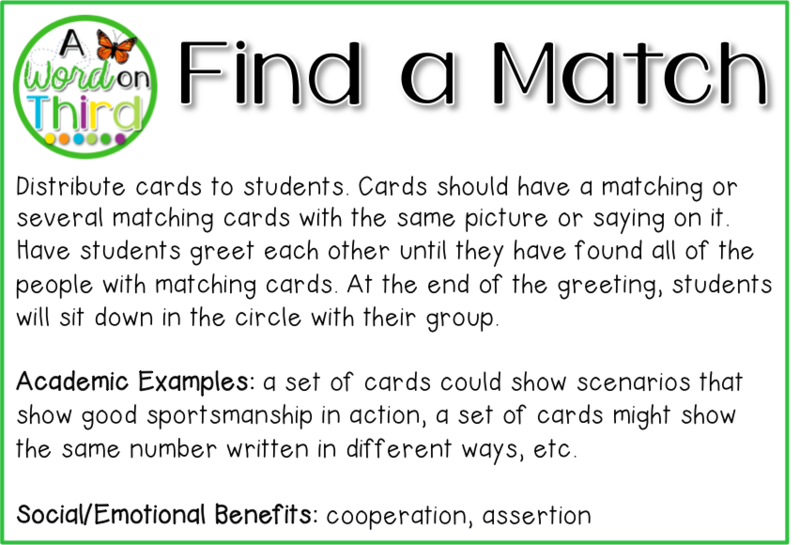 Matches can be numbers, words, animals... you name it! When I taught first grade, I would make matching sets of cards with pictures of farm animals and the sounds they made. The kids had fun moo-ing and oink-ing and got to practice decoding words really quickly while they were greeting each other. It was more for fun than anything else, but there can be a lot of value in this. 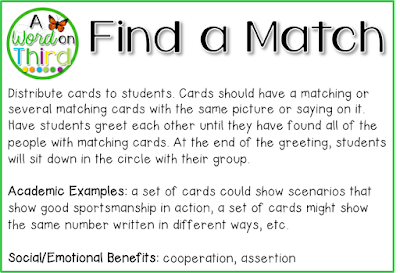 How easy would it be to make math cards with equations that have the same sum or difference? 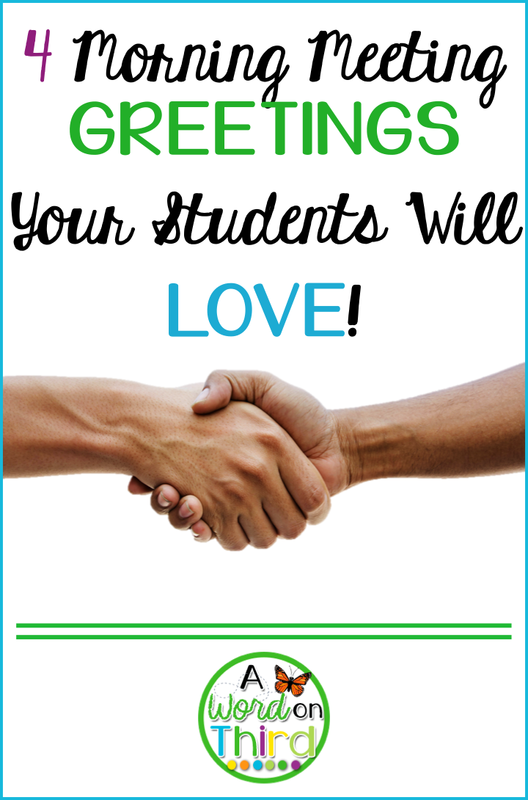 This is a great greeting for the beginning of the school year--it helps kids get to know each other, but it's a little less intimidating because there's no hand shaking or direct eye contact. The "popper" can share anything when they "pop," but it might help to teach into what a pop looks like when the popper is showing self-control. You could also adapt this to be the closing section of a unit or lesson. This is ALWAYS a favorite of my students! Baggage claim mimics the times at the airport in which you lose your bags. Students start by writing their name and the answer to a question on an index card (like "What's something people might not know about you?" or "What is something you learned about chemistry?"). This index card will be their baggage. 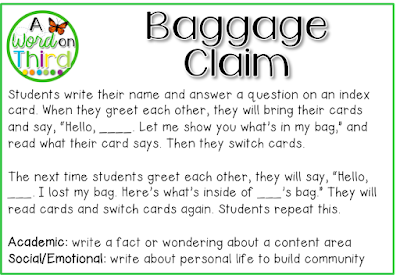 Then, they greet each other and read their fact in their baggage. Afterwards, they switch bags. Now they've "lost" their bags. Students now greet other students, reading off their baggage and swapping bags again. 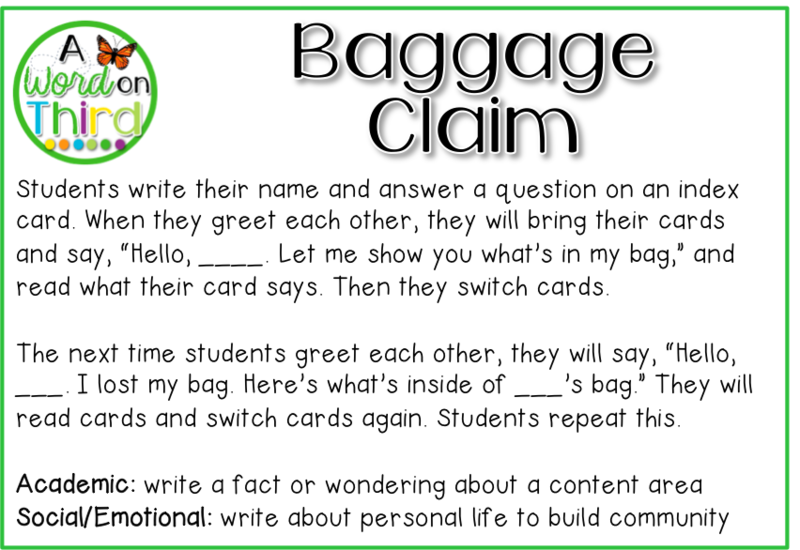 This is a great way to review information in an active way for a few moments, and it's an effective way to get kids greeting each other too. Adapt it as you wish! I find that posting a small anchor chart with the language kids should use when greeting other people is useful. I just wrote it on a big piece of construction paper and keep it in my easel's storage for easy access on days when I've chosen to use Baggage Claim as my greeting. The mingle greeting is my tried-and-true greeting for days when time is just not on my side. Only have a few moments to fit in your Morning Meeting? 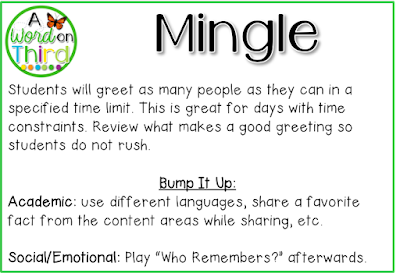 No worries--I just do a mingle greeting! I tell kids to greet as many people as they can within 30 or 60 seconds. Beforehand, we talk about what would be an appropriate amount of people to greet. We talk about how you can't really greet the WHOLE class and make them feel welcome in that amount of time. You'd be leaving out key parts of a greeting (like eye contact or smiling) if you tried that. So, which of these greetings is new for you? Which are you up for adding into your lesson plans? By the way, do you plan your Morning Meetings? I find they are much more successful when you take the time to plan them ahead of time. Just planning out my greeting, sharing, and activity ahead of time makes a big impact on fitting each component into the 15 minutes I have for Morning Meeting each morning! Fantastic goods from you, man. I've understand your stuff previous to and you're just too wonderful. I really like what you've acquired here, really like what you're stating and the way in which you say it. Custom essay writing service is an essential and crucial viewpoint of applicant. Numerous are obscure about how to set up a decent essay. So they are contracting essay services. To contract best one utilize this today.